Display yearly, monthly, weekly or daily calendar. Support for import and export of locations as defined in Internet draft "draft-norris-ical-venue-01"
Delete or modify individual events within a repeating event series. Location import and export support for VVENUE data as defined by the internet draft "draft-norris-ical-venue-01"
iCalendar export for calendars and individual events from the front end. iCalendar subscription support for the front end, support for both PC (http://) and Mac (webcal://) URL's. AcyMailing (Pro version only) - Plugin to add Zap Calendar events easily to an AcyMailing newsletter. Google Maps (Standard and Pro versions) - Plugin to display the map location of an event in the monthly, weekly, daily and event pages. iCal Sync (Pro version only) - Plugin to synchronize iCalendar compliant external calendars with Zap Calendar. 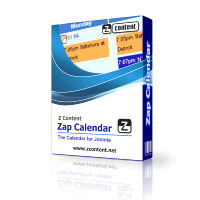 Note: Not all add-ons are available yet for version 4 of Zap Calendar. We are working on migrating them to the latest Zap Calendar release.